Egypt in late January, 2011, was a place of protests where people wanted and needed to be able to communicate as effectively as possible, and the use of social networks like Twitter had been filling that role. But what if there was no access to the Web to do so? Or internet access into or out of the country? A blog post on the Official Google blog told us of Some weekend work that will (hopefully) enable more Egyptians to be heard. In the press on February 1st, 2011, we learned that Google and Twitter launch service enabling Egyptians to tweet by phone. Methods, systems, and computer program products are provided for generating and posting messages to social networks based on voice input. One example method includes receiving an audio signal that corresponds to spoken content, generating one or more representations of the spoken content, and causing the one or more representations of the spoken content to be posted to a social network. The method described goes beyond just tweets to posting other kinds of social networks, with a conversion of the spoken message to text. It involves connecting to the service through pre-designated phone numbers, and it allows someone to create a message, edit it, choose a place to post it, and associate it with a specific user and account. It also enables someone to find other content related that that message, select recipients, listen to other messages on the social network, rate and mark messages as important or as spam. The spoken content that is converted to text to be posted to a social network through speech recognition might be filtered is some ways, such as for duplicate or blacklisted content. The message posted to such content on a social network might also be or include a link to an audio message. 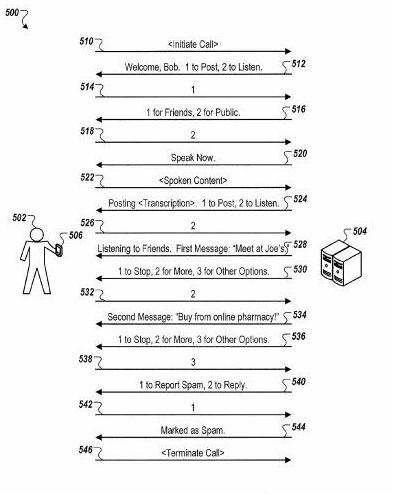 The patent filing provides a fair amount of detail over how such a system might work, and how someone might be able to make posts by voice and interact with other content on a social network. Will we see something like this spring up on Google Plus sometime in the near future? Well that sounds convenient. Dial a number, verbally post your ‘blurb’ or ‘micro-post’ and hangup. For people who use social networking for what it was actually intended for, than being communicating with friends, family and associates and not simply using it to spam the network, this sounds really convenient. Voice recognition technology has gotten so good now that this is the next logical step. I watched one of my friends take notes on their iPhone this way this past weekend and it didn’t mis-identify one single word. Pretty impressive. Now social media addicts can even post to their social networks when there’s no access to the internet… great. hehe. I think it’s great that people will be able to post to social networks without internet access. Obviously the Egyptian crisis last year was a great example of how this could be used. My only worry is that I hope the voice recognition technology will be better than Siri, because that seems to add more typos than it’s worth. Haha. Good question. Yes, I think they will use it on Google Plus and use it as one of the features that makes them different from Facebook and Twitter. In a case like Egypt, if this technology is available, won’t the government just shut down the phones? Excellent query. Yes, I think they will use it on Search engines Plus and use it as one of the functions that creates them different from Facebook or myspace and Tweets. In a situation like The red sea, if this technological innovation is available, will not the govt just close down the phones? Think this could be used for project glass possibly? Wow, this is definitely going to be interesting! Agreed, posting to social networks by speaking rather than typing would really be convenient! Previous Previous post: Google to Crowdsource Recommendations?